C-44 min ferric tape in red "Elmo", blue "Cookie Monster", green "Oscar the Grouch" and yellow "Big Bird cassette shells (pick your favorite one! ), with a beautiful custom cardboard box printed on both sides, inside hand drawn artwork by Keon Ching (Vingthor's 6 years old son), outside artwork comes with wiggly eyes, every cassette comes with free stickers! "This tape takes you on audio journey through a day in the lives of the residents of Sesame Street. You start your journey by waking up with Bob Johnson, having breakfast with Cookie Monster, housekeeping with Bert and Ernie, eating lunch with Big Bird, counting with Farley, after spending time at the playground its time to take a nap, dancing with Big Bird, bath time with Ernie, and then it's finally time to go to bed. 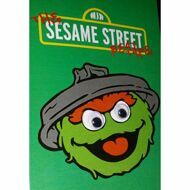 You even find out that the residents of Sesame Street are fans of Wu-Tang. This is the type of album that can be enjoyed by both adults and children. It's the nostalgia of your childhood with the hip-hop beats that you have grown to enjoy. This is a tape that you can easily share with your children without having to worry about the content of the music. Vingthor is one of the few artists that puts this much time and energy into each of his releases. This release is a great example of his work ethic. All the drums heard on this album were sampled exclusively from a variety of tapes. All of the Sesame Street samples are taken directly from vinyl records. Everything that can be heard on this album was sampled, chopped, and sequenced on a Roland SP-606. Then all of tracks were mixed on a Tascam PortaStudio 424 MKII to give it that great analog sound. All of the tracks were bounced to Protools LE Ver. 8.0.5 and for final touches the tracks were mastered using Logic Pro X. Not only did Vingthor put this much effort into the making of the beats, he also puts a ton of effort into the presentation of the tape that you will receive. He designs the tape labels and j-cards himself. Once he received the tape cases and boxes from the manufacturer he then records the tapes and packages everything on his own. His attention to detail is even carried over into the color of the cassette casings. This release comes in four different colors: red, yellow, blue, and green. Each of these colors were chosen because they correspond to the color of characters on Sesame Street. Red is Elmo, Yellow is Big Bird, Blue is Cookie Monster, and Green is Oscar the Grouch. He is the epitome of DIY and puts a great amount of care into every tape that he makes. So, do yourself a favor and pick up a copy of this tape, you will not be disappointed. I highly recommend this album to anyone that is a true hip-hop head and wants to reminiscence about something that they know and love from their childhood. Vingthor is for the children." B6. Where Is My Doggy?